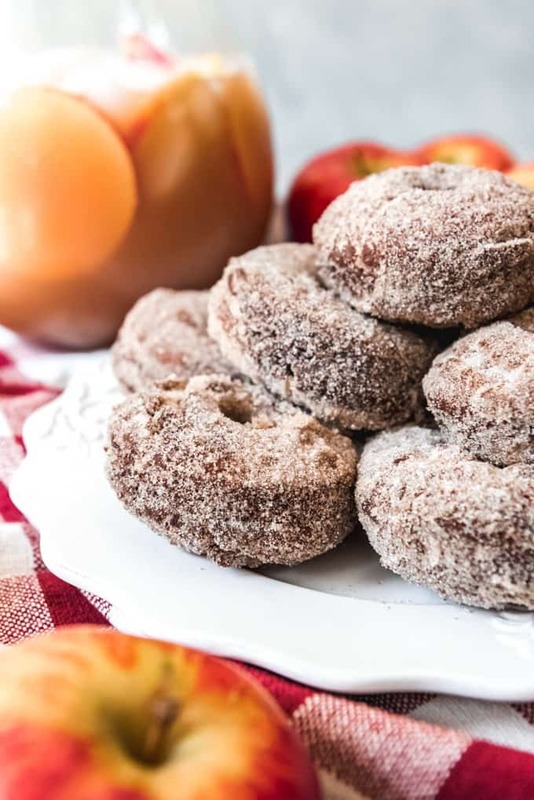 Apple Cider Donuts are a sweet treat that should be added to your fall bucket list this year! 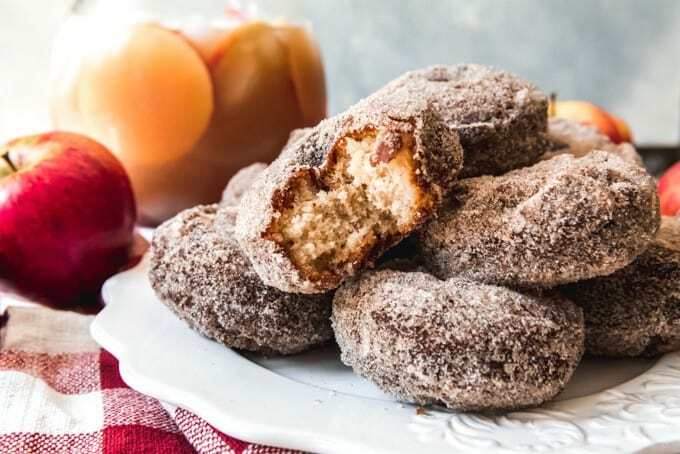 Sweet, apple-scented donuts with a cinnamon-sugar coating on the outside, these donuts are perfect for the fall season. We are lucky to leave semi-near to some apple orchards that we visit every fall. One of our options is near Sacramento, CA in an area known as Apple Hill. There are lots of orchards there and each fall you can go there for lots of apples and apple goodies like pies, syrups, cider, and these delicious donuts that my husband is obsessed with. 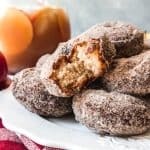 While I don’t often fry things at home, I made an exception for these apple cider donuts because I wanted to recreate them as best I could and I knew a baked version just wouldn’t cut it. Donuts are actually pretty easy to make. It’s a simple dough that needs a little refrigeration time since it’s so soft, then it’s just a few minutes on each side in some hot oil and voila – homemade apple cider donuts, fresh and ready for eating! 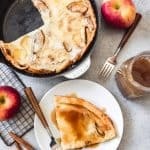 Keep scrolling past the recipe for most apple-inspired posts from some of my favorite food bloggers participating in Apple Week. 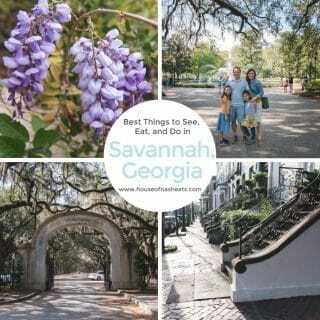 And be sure to click over and read my Apple Week welcome post and enter our big giveaway! 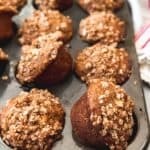 Okay, this might sound silly, but it makes a big difference to use real apple cider rather than just apple juice when making apple cider donuts. If you have ever wondered about the difference between apple cider and apple juice, it’s that fresh cider is raw apple juice that hasn’t gone through any systems or processes to filter or pasteurize it. It’s not shelf stable and has to be refrigerated to keep it fresh. Even then, fresh apple cider only lasts for about 2 weeks in the fridge before it starts to ferment. Apple juice, on the other hand, is filtered and pasteurized to remove solids and extend the shelf life. To me, the flavor is more sweet and less apple than cider. While you could use apple juice in this recipe, it just wouldn’t be the same. Instead, I recommend buying extra jugs of apple cider when it’s available, pouring about an inch of juice off the top, then freezing for later. 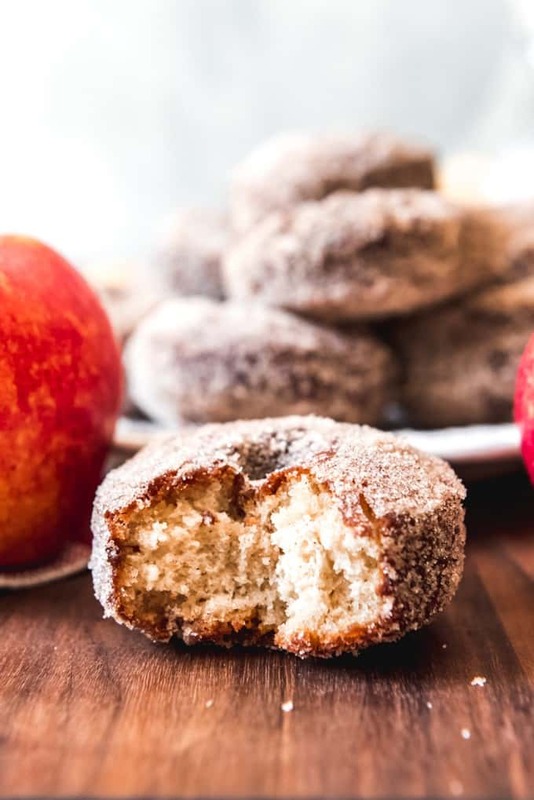 The key to really getting the moist apple cider flavor you can into your donuts is to reduce real, fresh apple cider down to concentrate the flavor without adding too much liquid to the dough. 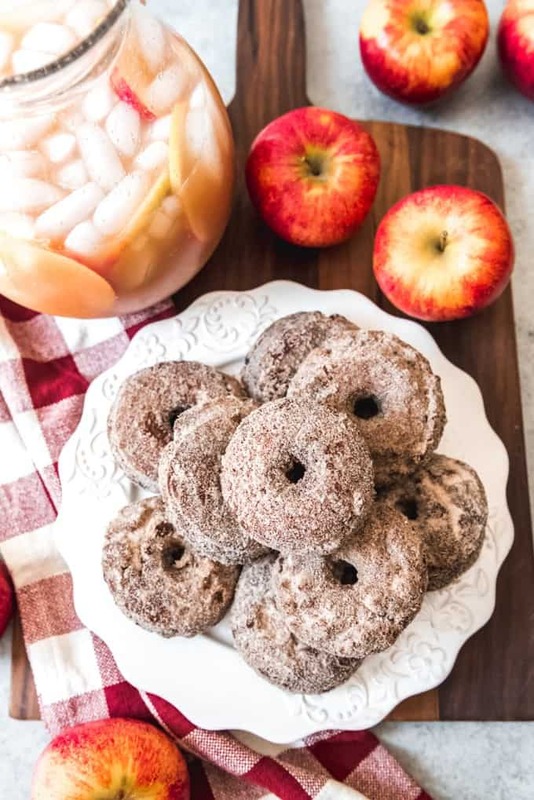 This one step takes a little time but it will really enhance the apple flavor of the donuts more than if you just used straight apple cider. 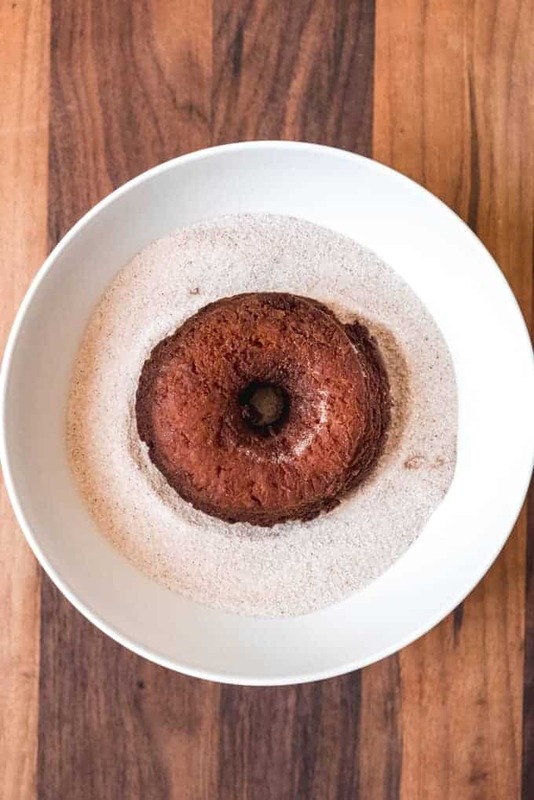 Another way to boost your apple cider flavor is to glaze the donuts with an apple cider glaze rather than opting to go the cinnamon sugar route. 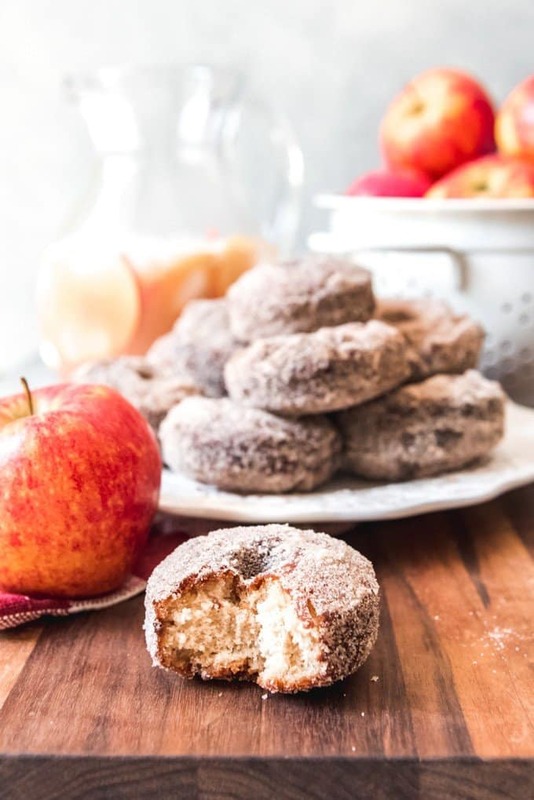 I’m including both options in the recipe below for you to choose from, but the photos are of the classic Apple Hill approach that my husband loves of cinnamon sugar coating on the outside of the crispy, apple-fragrant donut. 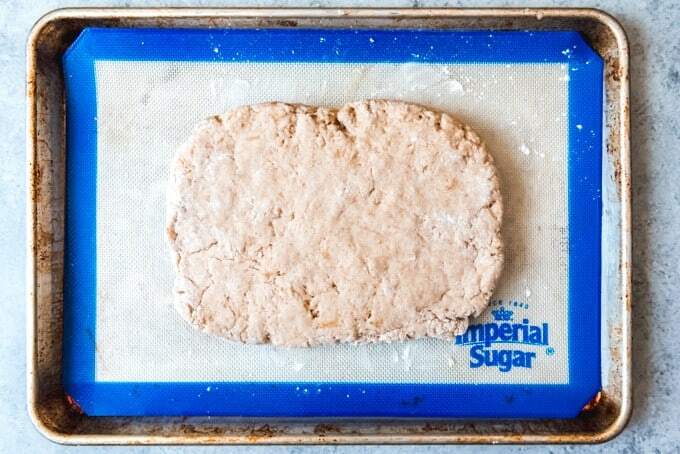 I used Imperial Sugar to make my cinnamon sugar coating and it was a hit with my family! 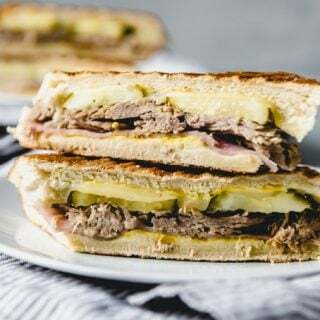 The are one of our Apple Week Gold Sponsors and you should definitely enter the giveaway on my first Apple Week post for a chance to win their prize package! 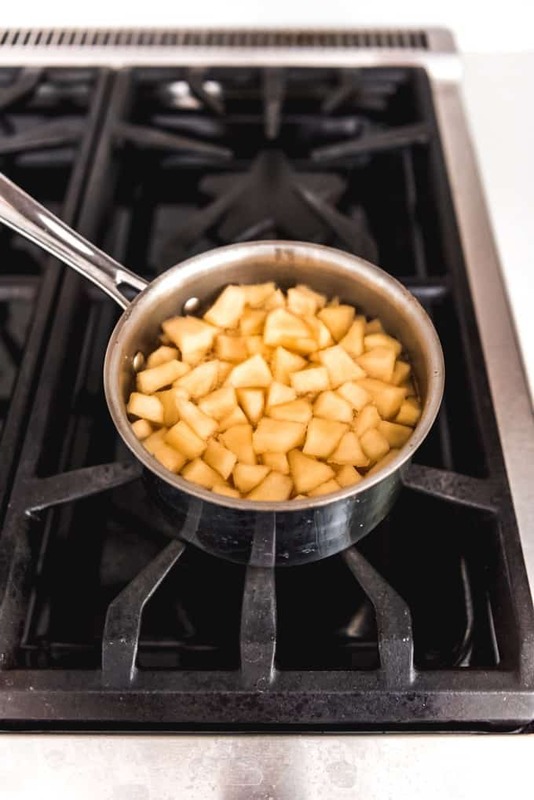 Start by reducing 3 cups of fresh apple cider in a saucepan along with 2 peeled and chopped apples by bringing the cider to a boil over medium heat, then cooking the apples and cider for about 15 minutes until the apples are soft and the cider has reduced down to only about 1/2 cup. Use an immersion blender to puree the softened apples and concentrated cider, or allow it to cool and transfer to a blender to puree. 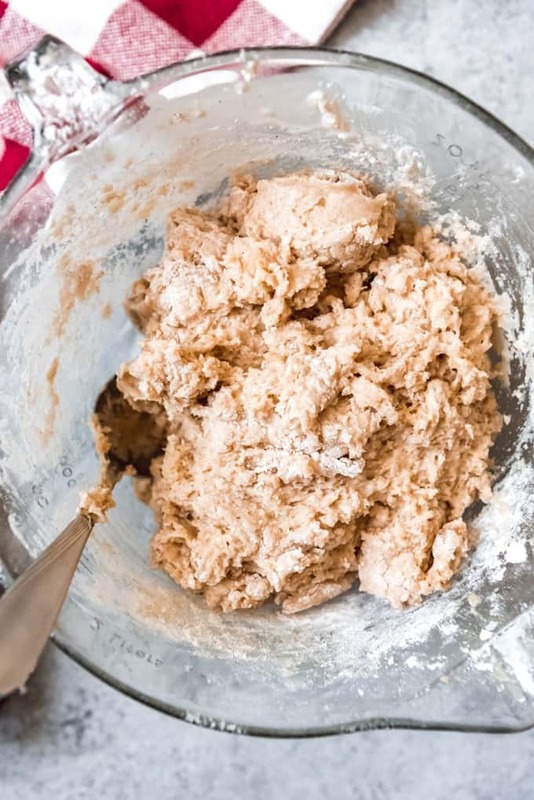 Make the dough by first whisking together the dry ingredients in a bowl to evenly distribute the spices. Then in a separate bowl, whisk together the sugar, melted butter, eggs, and cooled pureed apples and cider. 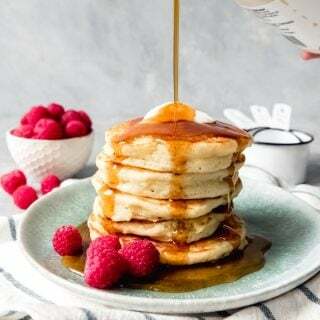 Whisk in the buttermilk and vanilla, then gently stir the wet ingredients into the dry ingredients just until the dough comes together. 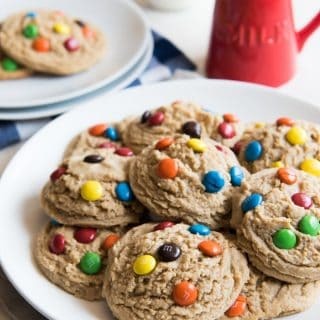 Line a baking sheet with parchment paper and sprinkle it generously with flour. Turn the dough out onto the floured surface and dust your hands with flour, then pat the dough out into a 1/2-inch thick rectangle. The dough will be sticky. 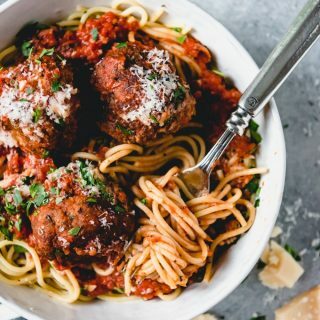 Cover the dough with plastic wrap and chill for 2 hours in the fridge or 20 minutes in the freezer. 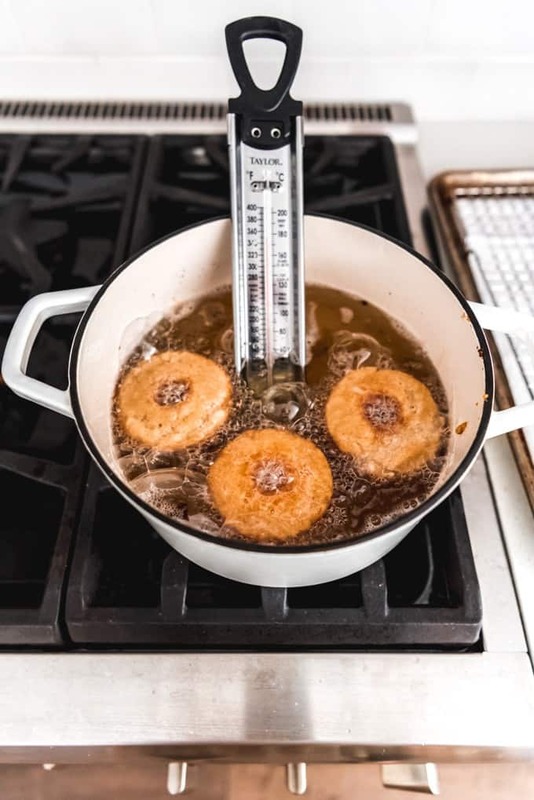 When ready to fry, heat 2 inches of oil in a large pan to 375 degrees F. Cut the donuts out of the chilled dough using a donut cutter or two circle cutters, 3- and 1-inch thick. 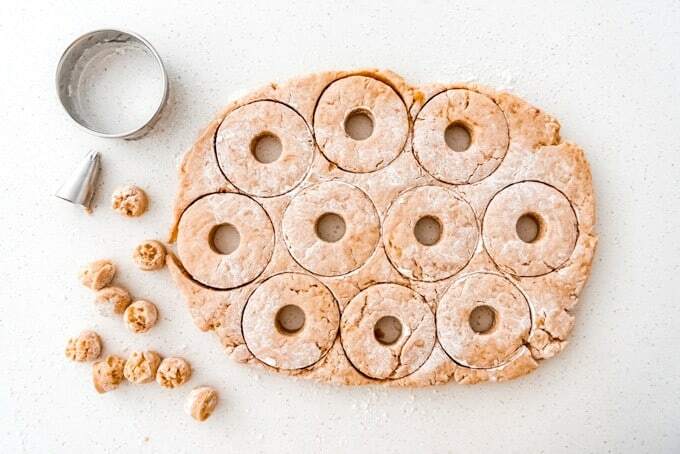 Combine scraps to cut out additional donuts. Fry 2-3 donuts at a time in the hot oil for 2-3 minutes on each side, flipping so the donuts are golden brown on the outside and cooked through, then transfer to a wire cooling rack to drain. Once the donuts are cool enough to handle, dip in a mixture of cinnamon and sugar or glaze before serving. Making apple cider glaze for apple cider donuts is super easy. In a medium bowl, whisk together 2 cups powdered sugar and 2-4 tablespoons of apple cider. 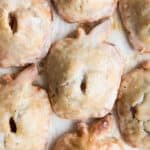 You can make the glaze thicker by adding more powdered sugar or thin it out with a little more cider until you reach a consistency you like. Dip the donuts into the glaze, then transfer back to the wire rack for 10-15 minutes so the glaze can set. In a medium saucepan, combine the apples and apple cider and heat over medium heat until boiling. Cook, uncovered for 15-20 minutes until the apples have softened and the cider is mostly reduced with maybe 1/2 cup of the liquid left. Puree with an immersion blender or allow to cool before transferring to a blender to puree until smooth. You should end up with about 1 cup of concentrated, pureed apple. If you have more, the cider probably needs to reduce a bit more, so just return to the pan and cook down a bit more until you are left with just 1 cup of puree. 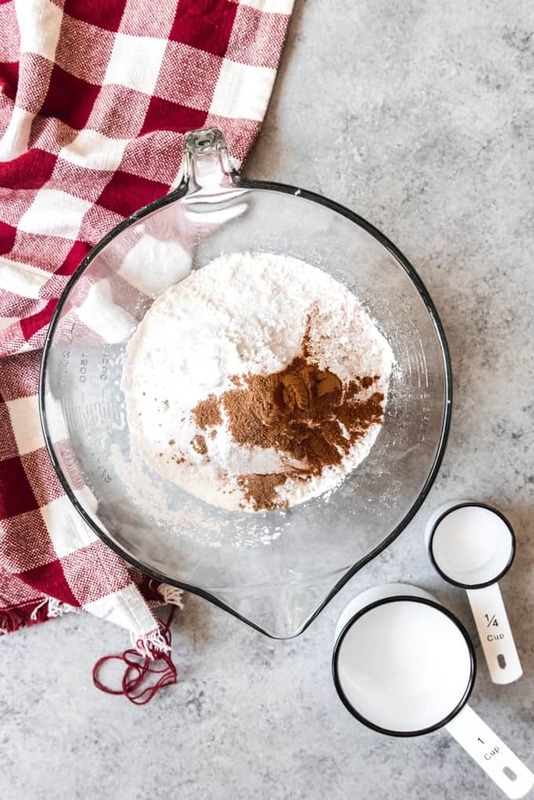 In a large bowl, whisk together the flour, baking powder, cinnamon, salt, baking soda, and nutmeg. 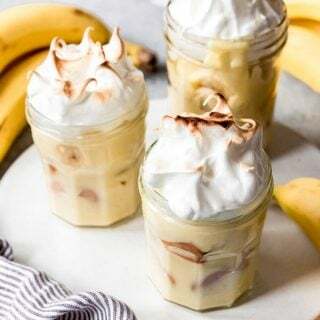 In a separate bowl, combine the sugar, butter, eggs, and reduced apple cider and apple puree. Whisk well, then add the buttermilk and vanilla and whisk again. Pour the liquid mixture into the dry ingredients and stir just to combine, taking care not to overmix. Line a baking sheet with parchment paper and dust generously with flour. Turn the donut dough out onto the floured surface and sprinkle a little flour over the top. Dust your hands with flour and use them to pat the dough into a rectangle about 1/2-inch thick. The dough will be very sticky. Cover with plastic wrap and refrigerate for 2 hours (or stick in the freezer for 20 minutes). 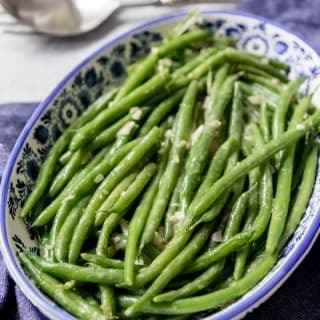 When the dough has chilled, heat 2 inches of vegetable oil in a heavy pot or dutch oven until the temperature reaches 375 degrees F on a thermometer. Set a wire rack over a baking sheet lined with paper towels for draining the donuts after frying them. In a shallow bowl, combine the sugar and cinnamon for the topping and set aside. Cut out the donuts using a donut cutter or a 3-inch biscuit cutter for the outer circle and a 1-inch cutter for the inside circle (I didn't have a 1-inch cutter so I used my largest frosting tip that was 1-inch in diameter). Save the inside circles for donuts holes and combine the rest of the dough and pat out again and cut into donuts until all the dough has been used. Working in batches, fry 2 or 3 donuts at a time in the hot oil, cooking for 2-3 minutes per side until golden brown on the outside and cooked through. Transfer to the wire rack to cool, then dip into the cinnamon sugar mixture, turning to coat. Serve warm. 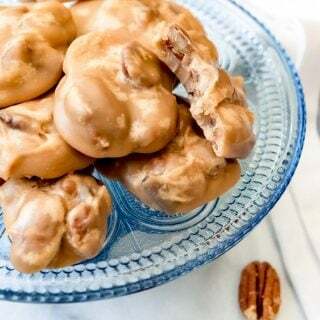 If you choose to make the apple cider glaze, just whisk the powdered sugar and apple cider together in a bowl, then dip the donuts into the glaze and let set for 15 minutes.